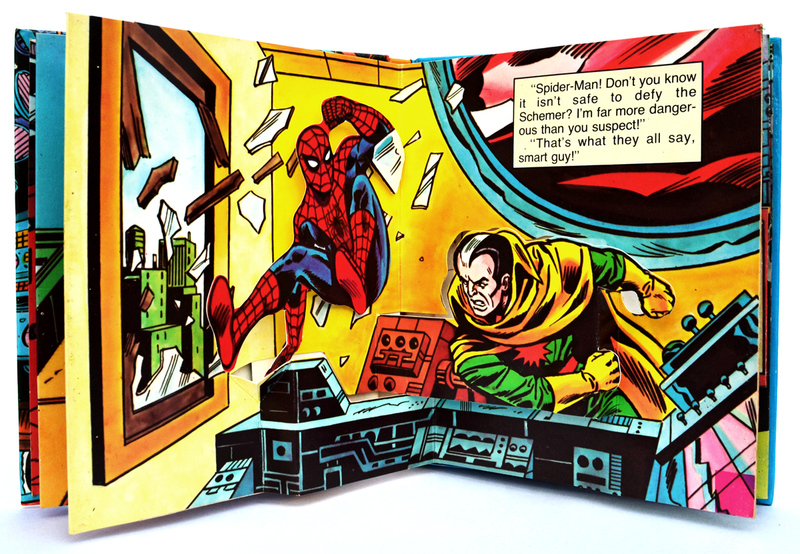 Spider-Man “The Schemer Strikes!” pop-up book (1982) | 'TAIN'T THE MEAT… IT'S THE HUMANITY! 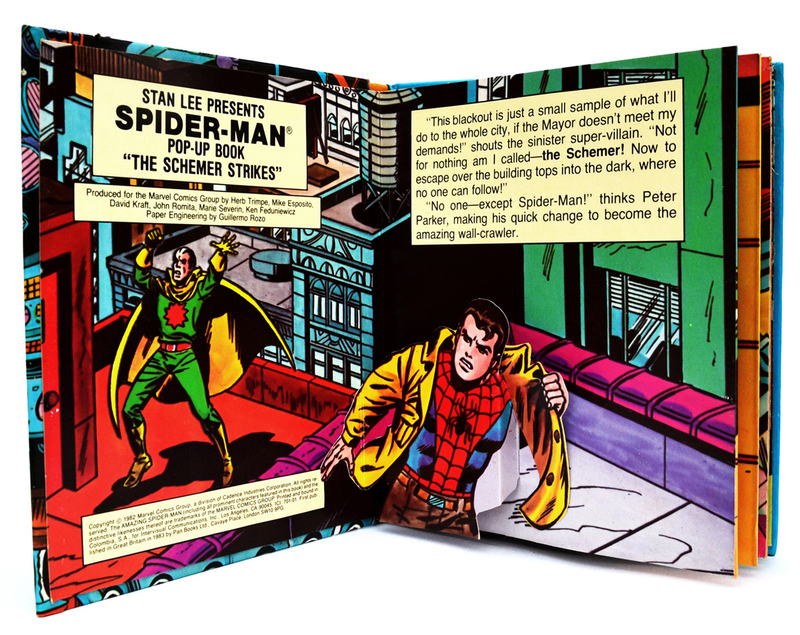 Published in 1982 by Piccolo Books The Amazing Spider-Man: “The Schemer Strikes!” was the third, and last pop-up book to feature Marvel’s popular superhero.. 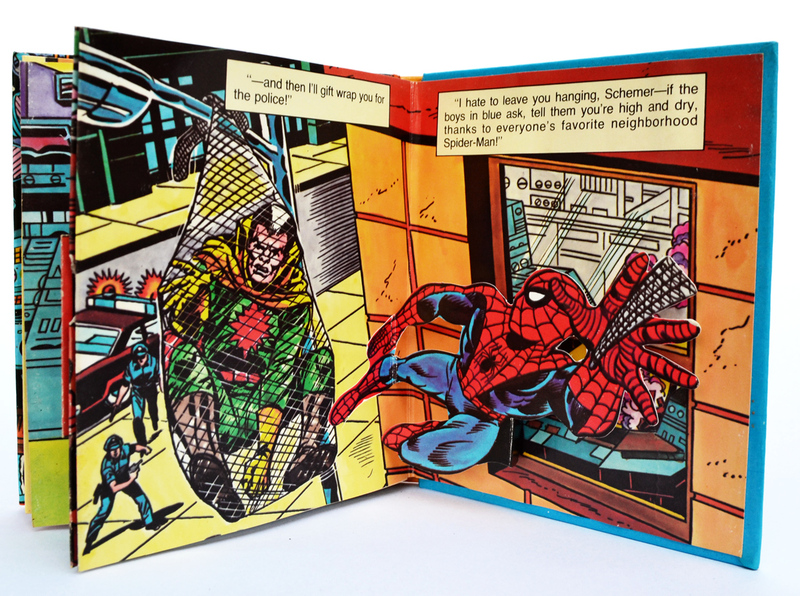 Similar to the two previous books in this series (Spider-Man and “Attack of the Tarantula!”) this edition featured a short story depicting Spidey in battle with a super-villain, this time it’s The Schemer (actually the son of Wilson Fisk, the Kingpin) who gets on the wrong side of the web-slinger. 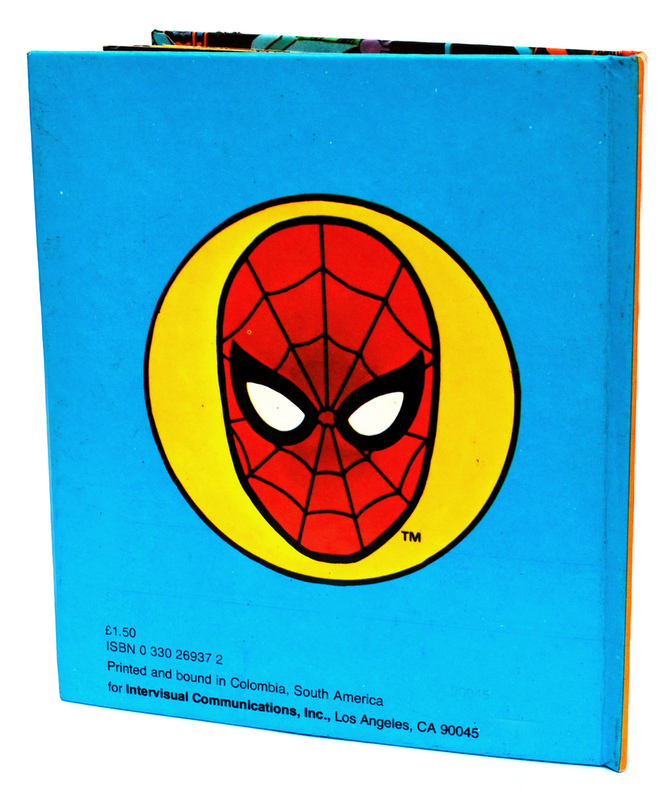 The book was published in hardback, measured 5.5 x 6 inches and ran to 14 pages. The UK edition sold for £1.50, or £4.50 when adjusted for inflation — pretty steep for such a small book. Collectors can find second-hand copies on Amazon and ebay for between £15-25. The story (such as it is) is enhanced by simple pop-ups that, thanks to the book’s diminutive size, don’t really do much– they certainly don’t ‘pop’. Unlike the first book (which measured a generous 8 x 11 inches) the smaller size of this book really doesn’t do it any favours and the pop-ups are more like ‘fold-outs’. 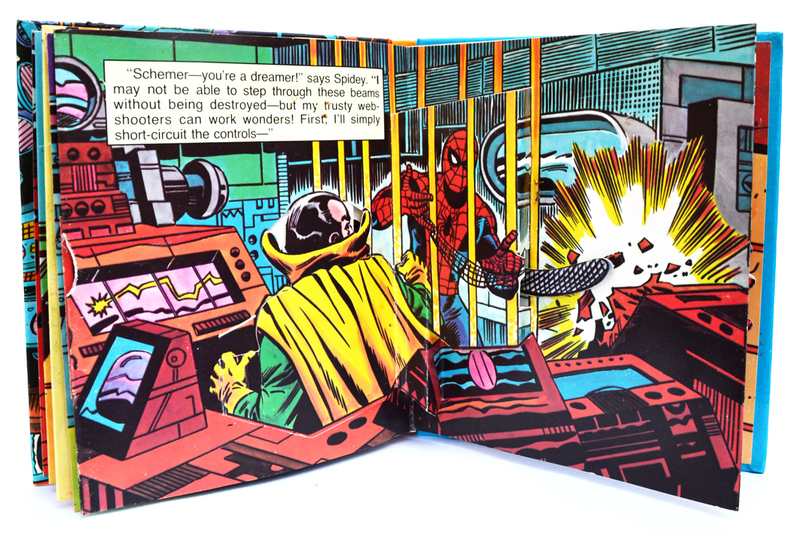 “The Schemer Strikes!” was produced with the help of several Marvel regulars, including John Romita, Herb Trimpe, Mike Esposito and Marie Severin. 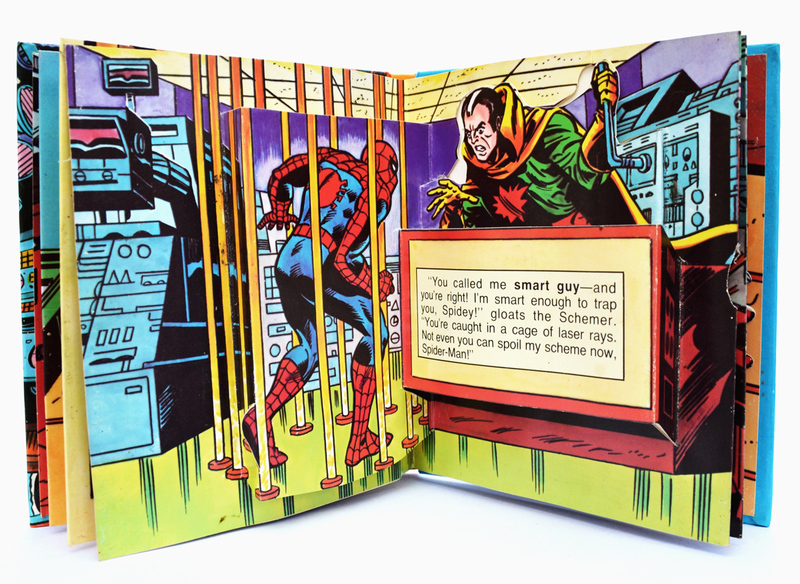 The pop-ups were engineered by Guillermo Rozo, who also worked on a couple of other Piccolo/Marvel pop-up books. … before handing the villain over to the police and swinging away. 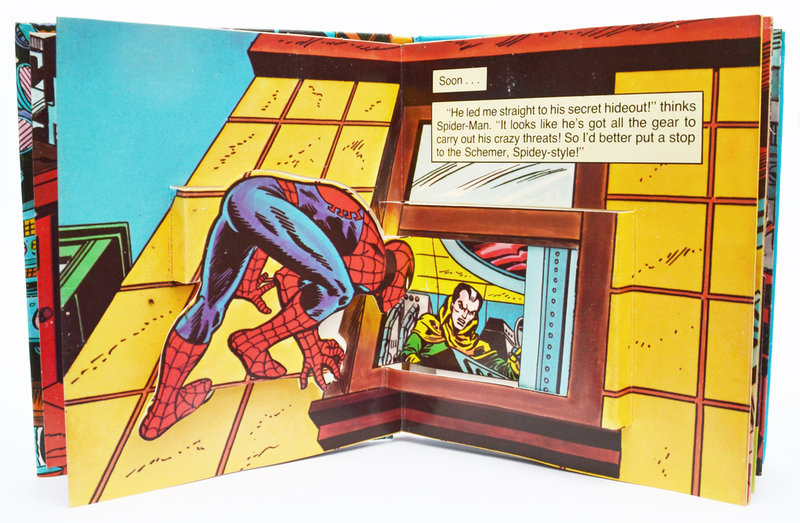 Pop-up books have come a long way in the last few decades and “The Schemer Strikes!” looks pretty crude in comparison. It still has a certain charm though even if it doesn’t really work as a pop-up book. 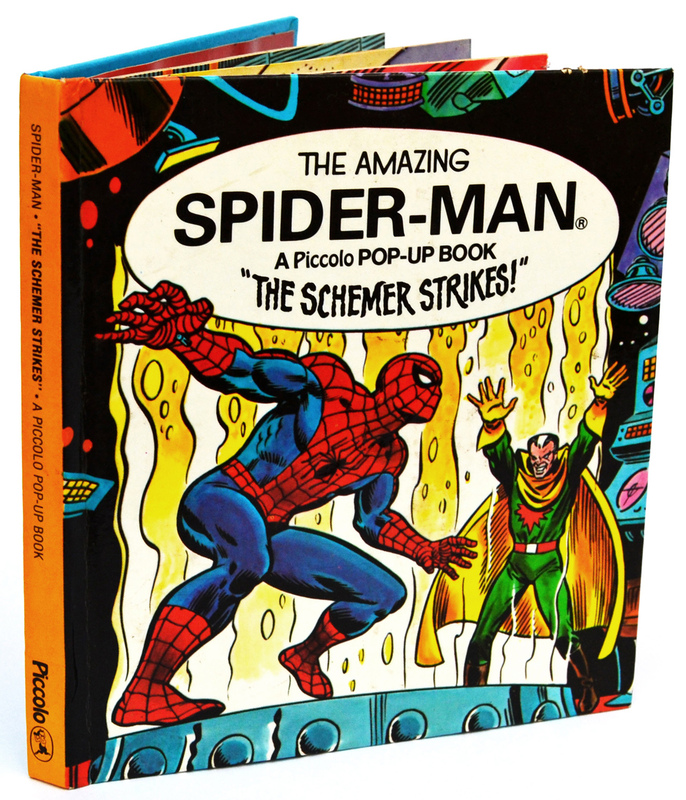 As well as the three pop-up books starring Spider-Man, Piccolo also published three editions featuring The Hulk — The Incredible Hulk, “Trapped!” and “Circus of Crime!” – click on the links to see more.